In a large bowl, cream together the peanut butter, margarine, brown sugar and white sugar. Beat in the eggs and vanilla. Combine the flour, baking powder and baking soda; stir into the peanut butter mixture. Form dough into walnut sized balls and place them 2 inches apart onto ungreased cookie sheets. Dip a fork into flour and criss cross each cookie to flatten slightly. Bake for 12 to 15 minutes in the preheated oven, until just lightly browned. Allow cookies to cool on baking sheet for 5 minutes before removing to a wire rack to cool completely. These 5-star cookies have big peanutty taste and zero gluten. I'm not sure why they didn't turn out great. The peanut butter taste wasn't very strong. Delicious cookies. I couldn't stop eating them, even as soon as they came out of the oven. I found that baking them for ONLY 10 minutes at 375 was sufficient enough, too. 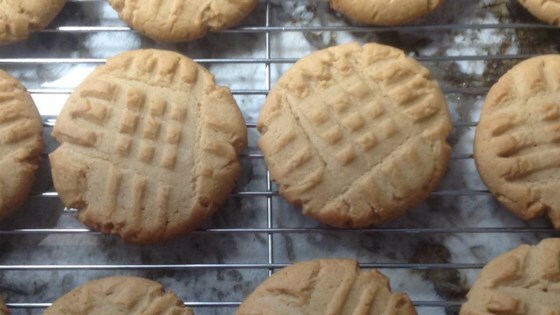 These cookies are THE BEST PB cookies I EVER made! I couldnt stop eating them! I used MELTED BUTTER instead and increased the vanilla to a TABLESPOON and added PB CHIPS!